I have never worked with crypto machines and do not have access to any classified information. No classified information appears on this or any of my other web pages. All the information is from open sources such as the internet and non classified manuals. M-94 is the U.S. Army nomenclature, CSP-488 is the Navy name. The M-138-A is a strip cipher version. The Jefferson Disk (Wiki) aka: Bazeries Cylinder (Wiki) works on the same idea, but is much older. Used through the end of W.W.II. Magnetic tape holds a short message that is sent using 300 Word Per Minute Morse code (Burst transmission (Wiki). Can be used with the GRC-109, PRC-64, Delco 5300, PRC-74, PRC-316, PRC-319, PRC104 & probably most modern radios that support CW operation. Works with the PRC-77 but not the PRC-25. Mechanical key loading. NESTOR system replaced by VINSON. 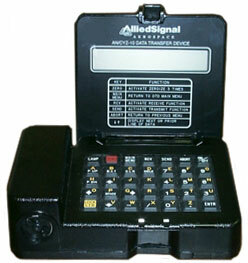 Used with a large number of radios for both voice, fax and data. 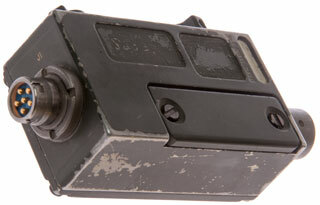 Used with PRC-104 and other H.F. radios. What encryption system, what will it interoperate with? Let me know. Replaces the KY-57 and other equipment. Requires new interconnecting cables. Uses a 40 character key based on 5-level paper tape. Originally designed to work with the PRC-77. Uses thumb-wheel switches to set key. Should work on any radio via audio input & output. Has an Over The Air Rekeying (Wiki) capability and individual serial number. There may be a shut down function that works by unit serial number. Can use a crypto key for reception of the GPS L2 frequency. Version of the Trimpack that decodes encrypted L1 to avoid problems when SA was turned on. 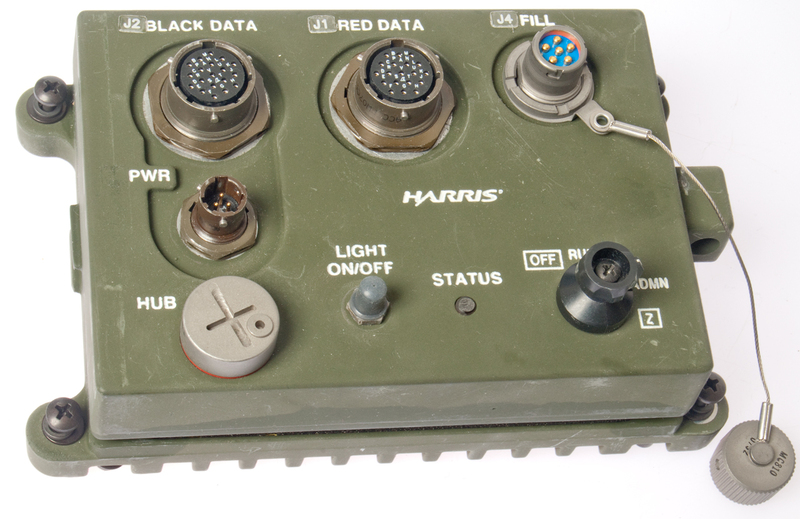 Requires key load for encrypted signals but works as civilian receiver without keys. There are a large number of crypto boxes used to encrypt/decrypt teletype transmissions. This is the most common digital data application. FS-5000 Spy Radio, uses I&Q modulation for Tx and Rx. Most likely that the missing control box contains some type of encryption that would allow the spy to compose a message in the field and send it as well as decrypt an incoming message. This would require inputting a key. If the missing control box did not contain any crypto function it may not have been destroyed. There's a plethora of crypto machines designed to encrypt/decrypt teletype transmissions. That's an area that I'm interested in, but not one where I have a collection of equipment. The most interesting one of those is the KW-7 Orestes (Jerry Proc) & KL-7 Adonis. That's because I worked for TRW Microwave at the time the book "Falcon and the Snowman" (Wiki, IMDB, Amazon) came out. Also the John Walker Family Spy ring (Wiki) caused the Pueblo to be captured so the Soviets could get these machines. Would use the Sierra II' crypto chip which is the basis of all the Type 1 cryptography. But this is a new empty box. Wiki "The KG-84A and KG-84C are encryption devices developed by the U.S. National Security Agency (NSA) to ensure secure transmission of digital data. The KG-84C is a Dedicated Loop Encryption Device (DLED), and both devices are General-Purpose Telegraph Encryption Equipment (GPTEE). The KG-84A is primarily used for point-to-point encrypted communications via landline, microwave, and satellite systems. The KG-84C is an outgrowth of the U.S. Navy high frequency (HF) communications program and supports these needs. The KG-84A and KG-84C are devices that operate in simplex, half-duplex, or full-duplex modes. 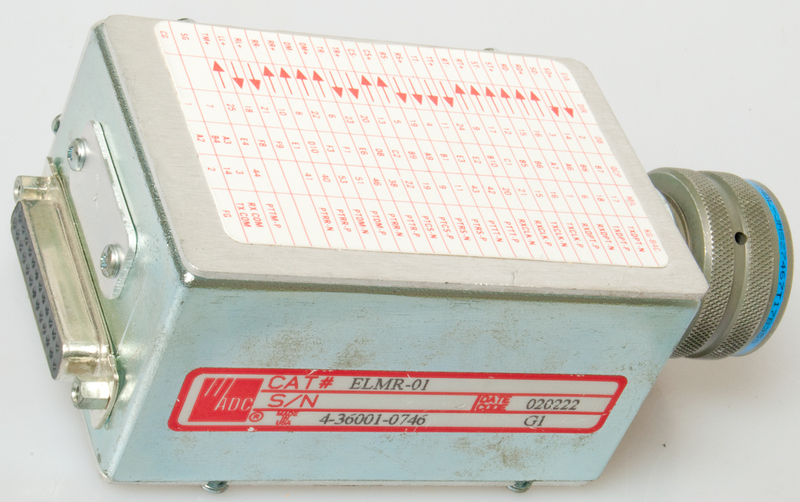 The KG-84C contains all of the KG-84 and KG-84A modes, plus a variable update counter, improved HF performance, synchronous out-of-sync detection, asynchronous cipher text, plain text, bypass, and European TELEX protocol. The KG-84 (A/C) is certified to handle data at all levels of security. The KG-84 (A/C) is a Controlled Cryptographic Item (CCI) and is unclassified when unkeyed. Keyed KG-84 equipment assumes the classification level equal to that of the keying material used." There are a number of different things that can be filled. a SINCGARS or Have Quick hop set telling the radio what frequencies are allowed for frequency hopping. a SINCGARS or Have Quick lockout set telling the radio what frequencies not to use. 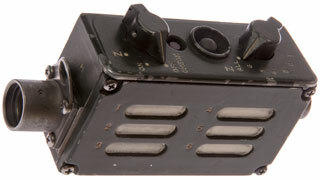 a SINCGARS or Have Quick Transmission Security Key (TSK) telling the radio the order to do the hopping. There are probably many more different keys used for data (teletype) and for trunked phone systems that may be the same as the above or different. There are two electrical formats for key fill. 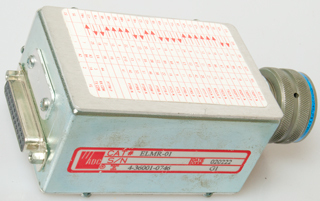 DS-101 (the newer of the two protocols) like used with the CYZ-10 and DS-102 like used with the old KOI-18 paper tape reader. I think the DS-102 uses six volt levels working from ground to a negative potential whereas the DS-101 uses TTL (zero and +5 V) levels (RS-485). Note there are many key types (Wiki: List of cryptographic key types, Key Size) and the fill device needs to be able to handle the desired keys. DS-102 protocol. 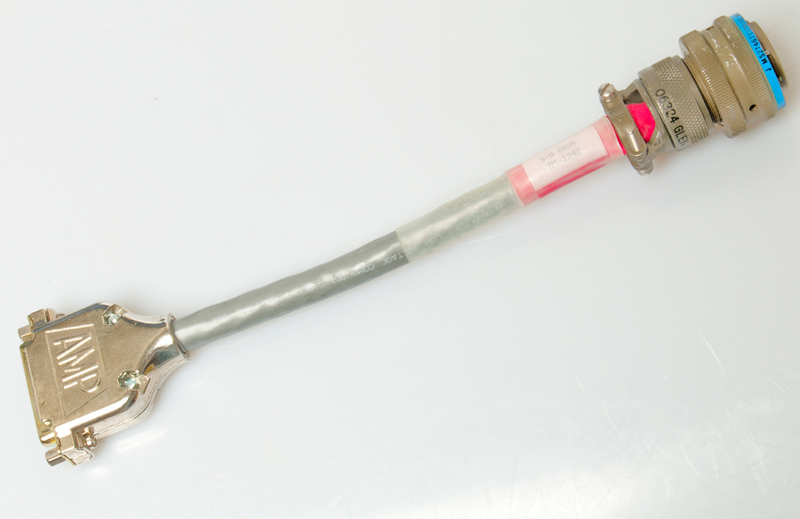 The KOI-18 may be the oldest electrical key loader (the KY-38 used a mechanical key loader). Used to load the Transmission Encryption Keys (TEK) into the KY-57 and about anything that needs a key. It uses a photo optical reader to read a paper tape that's pulled through the reader by hand. Very versatile since what comes out depends on what is punched on the tape. Other key loaders have electronic registers that can only hold keys in predetermined formats. Fig 13 8-level tape (Wiki) is 1" wide. Fig 14 Note grouped as 3-space-5. The space is where the sprocket holes are. Fig 15 The rod with the blue tape seems to be made of carbon and is the common ground for the wire fingers that sense the 8 data holes. Note there is no sensor for the sprocket holes. I've heard that it uses 8 level ASCII type tapes rather than the older 5 level Baudot tapes. Note that the data holes are larger in diameter than the sprocket (clock) holes. This is important since the leading edge of the sprocket hole can be used to latch the data bits and the trailing edge of the sprocket hole can be used to shift out the data bits. This would not work if all the holes were the same diameter. In the old mechanical tape readers, like on the Teletype Corp. Model ASR33 machine, there was a plastic wheel with pins that match the sprocket holes and it pulled the tape through a reader that worked using mechanical pins to sense each data hole. Inside there's probably a parallel in - serial out shift register. The parallel inputs are driven from the data holes. The shift register data is latched on the rising edge of the sprocket hole and on the falling edge a pulse generator sends 8 clock pulses which are used both to clock out the shift register data bits and to provide the clock signal to the device being loaded. The clock rate needs to be fast enough to get all the bits sent before the next set of holes gets to the tape reader. If the tape was pulled at 3 feet per second and the pitch of the data was 0.1" then there would be 360 words per second (8 bits per word) or an average rate of 2,880 bits per second, so the internal clock generator needs to run faster, say 5,000 bits per second. If the operator pulls the tape too fast the bits will get corrupted. To check for this the tape needs to be punched with parity, Cyclic Redundancy Check (CRC), check sum or some other data to be sure the correct key gets loaded. This is not a part of the key loader, but instead is part of how the data is punched into the tape. This check can also be used by the the device holding the key to tell the difference between no key and a valid key. The device being loaded should not function without a valid key and it's cold start state should be such that it is recognized as a no key state. For this reason even parity is not a good way to go because a key of all zeros would have even parity. If odd parity is used a key of all zeros fails a parity test. Note that an asynchronous data system, like RS-232 that uses start and stop bits will not work with a hand pulled paper tape reader because the baud rate can vary over a huge range. This is why a synchronous system is used that has data and clock channels. Newer key loaders that are not paper tape based continue to use the data plus clock format for backward compatibility. 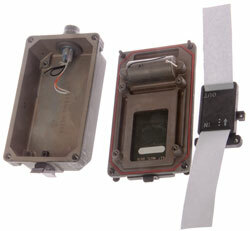 General purpose tape reader, KOI-18/TSEC, controlled cryptographic item (CCI). The National Security Agency (NSA) has directed that a fill cable be connected to the fill device when transferring a key. KOI-18 tape reader, general purpose. (a) Battery operated, hand-held device. (b)Converts eight-level standard paper and mylar tape to serial electronic information. (c) Loads keys from prepunched tape to other COMSEC equipment, KYK-13 or KYX-15. (d) Has no storage capability. (e) Tapes are normally generated ahead of time and stored for later use. May be distributed by mail or courier." There is no limit to the key size since it will just read whatever is on a tape. There are two very major problems with this system. First the amount of key material is gigantic and the logistics of getting the keys where they need to be is a huge task. Because the keys need to be made at NSA well before they are used they are vulnerable to being copied or compromised anywhere along the path to the end user. This has happened more than once during the cold war. One attempt has been made to secure the key tape between it's generation and use is a canister that claims to prevent returning a key tape. DS-102 protocol. This electronic key device looks very similar to the MX-18290 and is designed to hold TEKs and so replace the KOI-18. THe KYK-13 is smaller than the MX-18290. Uses the common crypto battery BA-5372/U. 20 Aug 2004 - there is some confusion about what key size the KYK-13 can hold. The PLGR can use the KYK-13 to load its GPS key which is 128 bits long. But other references say the KYK-13 can only hold a 64 bit key. I think it's 128 bit keys. 1. Connect the LOI-18 to the KYK-13. 2. Turn the KYK-13 selection knob to the desired buffer. 3. Open the latch on the LKOI-18. 4. Insert the paper tape (printed side up) into the slot marked IN. 5. Turn the KYK-13 command knob to ON. 6. Push the load INIT switch on the KYK-13. 7. Pull the paper tape thorough the KOI-18. 8. Turn the KEY-13 command knob to OFF. 10. If more keys are needed to be loaded, turn the selection knog on the KYK-13 to the desired buffer, and startr again at step 3. DS-102 protocol. Don't have much info in this Net Control Device, but it can load a TEK. TM 11 5820-890-10-3 pg 102 (3-20). Probably can hold different types of predefined variables and can load more than one variable because a switch allows selection of those that need to be loaded. This would make loading all the different variables into a modern SINCGARS radio much easier that with the above key loaders. The VG switch position may mean Crypto Net Variable Generation, so this device actually generates a key. Used to load all the KY-57's on a SINCGARS radio net. It must support 128 bit keys. that have been cut as part of de-mill process. Note that local key generation is a revolutionary concept. All prior keying methods depended on distribution of keys that were centrally generated. The problem with that is a spy (Walker Family for example) that gains access to the unused keys can comprise the whole system. In order to generate local keys requires a high quality hardware random number generator based on a noise diode or some other physical noise mechanism, not on any software algorithm. 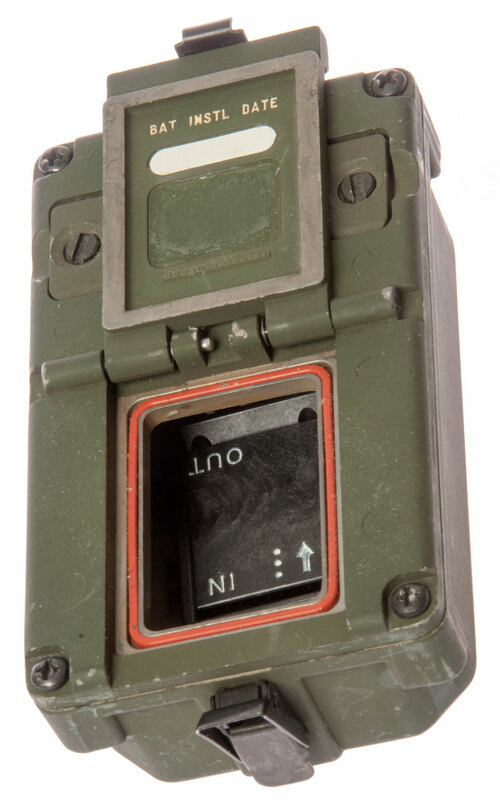 When a network of SINCGARS radios have their keys loaded using Over The Air Rekeying (OTAR) from the KYX-15() you know that the keys have not been compromised. DS-101 Protocol. Data Transfer Device (aka ANCD, aka "Crazy 10") that holds all the keys needed for the SINCGARS and also holds Standard Operation Instructions (SOI). Battery: DL123A, U9VL EMER ONLY, BA-3090/U - this is the very common 3 volt 123 photo battery. This is the newest variable loader and it can hold all the different key formats now used and other stuff. It's internal clock is not good enough to set the time in a frequency hopping radio like the SINCGARS or Have Quick radios, not because of dropping battery voltage, but because it uses a crystal oscillator. All crystal oscillators change frequency with aging, temperature, power supply voltage, and other factors. 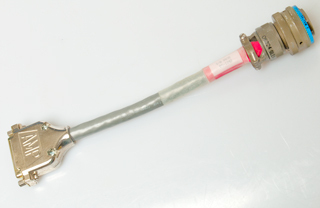 SINCGARS Fill cable is CX-13467, NSN 5995-01-379-9689. 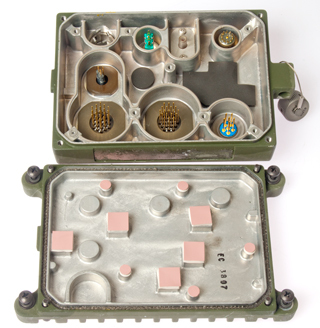 Note that the SINCGARS needs a number of different fills for both frequency hopping and for transmission security. It's not clear if the Crazy 10 supports key generation. If not it needs a modification to support key generation. The Crazy 10 uses 3 each common 123 photo batteries (aka BA-5123/U) in a battery adapter (NSN 5810-01-348-3147) that has standard "9 Volt" battery snaps. This way a common 9 Volt battery can be used if the 123 batteries are not available. But the common 9 Volt battery has only 0.6 AH compared to the 1.4 AH of the 123 battery. Also the cold temperature performance of common 9 volt batteries is very poor at and below freezing where the 123 battery is still going strong. PS Magazine #571 pgs 48-51 - Beating the Battery Blues. This is the replacement for the CYZ-10. Looks sort of like a hand held PDA. It would be interesting to learn how good it's internal clock is. i.e. can it be used to set the date and time or is a seperate GPS still needed? Ans: the PYQ-10 clock is the same as the Crazy-10 clock. Too bad they didn't improve it. I think I know how to make a 1,000 times improvement for a small amount of money. from a now turned off Navy web page. The KG-40A is a mandatory modified version of the older KG-40, which incorporates variable fill capability. The modification entails replacement of a printed circuit board (motherboard) and the front panel assembly. 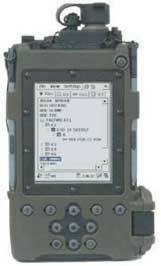 The KG-40A provides enhanced security using an improved cryptographic algorithm and electronic key capability. Because the KG-40A key is a standard 128-bit key, it can only be keyed by the AN/CYZ-10 Data Transfer Device (DTD) or a KOI-18 Common Fill Device (CFD). It cannot accept key from the KYK-13 Electronic Transfer Device (ETD) or from the KYX-15 Net Control Device (NCD). The KG-40A is an UNCLASSIFIED controlled cryptographic item (CCI) when unkeyed and is interoperable with the KG-40. When the KG-40A is keyed, classification equals that of the key installed. There needs to be a way for the device that's holding the key to know that the key has been loaded without errors and maybe that it's the proper type of key for that device. For example there are a number of different devices that use keys of the same length. Loading a valid key for device "A" into device "B" might not be correct. The first test parameter would be the overall length of the key, i.e. some number of bits. The next in terms of simplicity would be a parity check, i.e. is the sum of the "one" bits in an 8 bit byte or a 16 bit word even or odd. Note that a key of all zeros or all ones, like would be there at first power up, has even parity, so using odd parity will tell you that there's something there other than an all zero key. The next level of checking would be a Cyclic Redundancy Code. This is a check to be sure that there are no single bit (or more depending of the details of the particular CRC used) errors in the key. It's appended to the end of the actual key. A feature of some CRC methods is that you can append zeros onto the input data and run the algorithm to get the CRC bits which are then used to replace the zeros. Now when the block that includes the data and appended CRC bits is run through the algorithm the result is a zero byte. It may be the case that instead of filling the to be determined CRC location with all zeros you can fill it with any number and get that number when running the CRC on the data plus CRC. For example if placing zeros results in a zero CRC result, placing 1 might result in a 1 CRC result. If that works then you could have 256 different CRC flavors if the CRC was a single byte. These could be used to identify the type of data the key contains, for example is it a voice security key or is it a GPS key, how long is the key good, etc. The KY-57, SINCGARS and a number of other systems support the OTAR concept. The key being sent is encrypted with a Key Encryption Key (KEK) with equal to greater security than the key it's encrypting. The encrypted key (the black key) is sent over the air. Although anyone may receive the black key it does them no good without knowing the KEK. The receiving equipment decrypts the black key into a usable red key inside the equipment. End use crypto equipment is designed in such a way that you can not get the red key as an output. Fill devices are designed to load but not unload red or black keys. In the NSA paper A History of U.S. Communicatios Security (Vol 1 1973 and 2 1981), the David G. Boak Lectures, NSA (pg 113) there is a little discussion about SAVILLE Automatic Remote Keying (SARK). SAVILLE is part of the keying system implemented in the KY-57 which was the first equipment to have this capability. There are two schools of thought as to why it was done. One is that it was done to solve the huge logistics problem of supplying the needed key material. The other is that it was done to reduce the occurrence of keys that get to the enemy, for example John Walker. 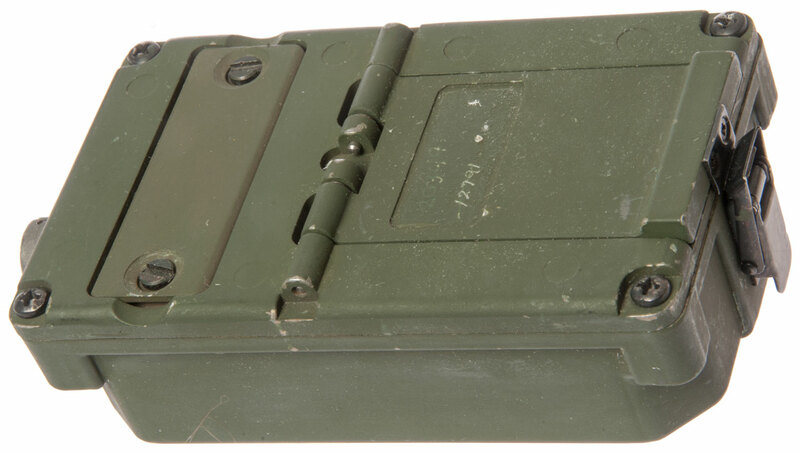 A problem with OTAR (aka: SARK) was that the military had been trained to not leave active (keyed) equipment unattended or not locked up, so it was common for users of the KY-57 to zeroize the box at the end of each day. That means there must be a nearby key fill device to reload it the next day. So operationally it really didn't pan out. The DAGR GPS receiver has OTAR capability but with a new twist. It has a unique Electronic Serial Number (ESN) like a cell phone. The DAGR is only classified to the level of the key that it's holding so a DAGR without a key is not classified allowing it to be supplied without all the red tape that classification entails. It is however a Controlled Cryptographic Item (CCI) and must be accounted for. This appears to be a solution to the OTAR problem since the crypto variables could be remotely erased from a unit that was unaccounted for or was known to be stolen or captured. But if the designers of the DAGR have been a little cleaver they would include a low power transmit capability in the DAGR which can only be activated from the GPS. The signal would be a spread spectrum signal, similar to the GPS signal, but not interfere with GPS and could be received by either the GPS satellites or some other ELINT type satellites. An analysis of the Black Box showed that this is very possible. This way a stolen receiver could be queried and report it's position, sort of like Lojack (Wiki). The use of ESNs in crypto equipment has obvious benefits so I expect it's already being done. When a Red key is combined with it's crypto system the plain text information is accessible. Since the cipher text and the crypto systems are in the public domain the Red key needs to be well controlled to protect the information. There are two major problems associated with protecting Red keys. First, it takes a long logistics chain to supply authorized users with the keys they need. That long logistics chain causes the second reason, the Red keys are prime targest of spies. An example is the Walker Spy Ring (Wiki). In addition to the Red key itself there is also how the key is handled in hardware. If the Red key or data can be tapped in the hard ware then it still may be captured. For example GPS receivers with the Percision Positioning Service - Security Module (PPS-SM) such as the SLGR or PLGR process the Red key and output plain text to the rest of the receiver. That plain text could be tapped and recorded allowing someone to then key other like GPS receivers. Black keys are Red keys that have been encrypted with a Key Encryption Key (KEK). Black keys can be freely distributed and even transmitted over radio channels. The use of black keys solves some of the problems of Red keys. My grandmother had a saying "Don't put all your eggs in one basket". The idea is that if the basket is dropped you loose all the eggs. The analogy being if the enemy somehow gets the KEK then all of the Black keys can be turned into Red keys. But if the crypto equipment converts the black key into a red key or into plain text information then capturing keyed equipment opens the door to getting all the plain text in the system. If the hardware does not expose the red key or plain text then the use of black keys is much more secure. That's probably the main reason the PPS-SM is being replaced with the Selective Availability/Anti-Spoofing Module (SAASM) (Wiki). 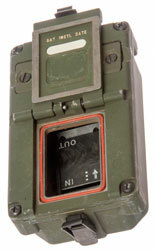 The DAGR GPS receiver also has an Electronic Serial Number (ESN). The ESN is hidden in the SAASM hardware chip (not like a cell phone where it can be forged). This allows messages specific to that GPS receiver to be sent. I'm guessing it's similar to an IP address. If so then black keys could be sent to a group of GPS receivers from the GPS satellites. The problem I see with doing it is there needs to be some way that you know all the receivers being rekeyed are in the possession of authorized personnel. If that's not done then there's a chance you will be rekeying a unit in enemy hands. Also you probably can erase all the currently loaded keys. The modern crypto equipment no longer used punched cards but the KOI-18 paper tape reader is still the most versatile in terms of supporting various key types since it does not have any built in protocol dependencies. The two serial fill protocols are DS-101 and DS-102. Neither of the specs are in the public domain. DS-101 is based on RS-232 (asynchronous, i.e. just bipolar data and ground, no clock). DS-102 is based on a negative polarity key fill protocol that uses a data and clock line. Not used for voice security. Fill Cable - not sure, but probably. 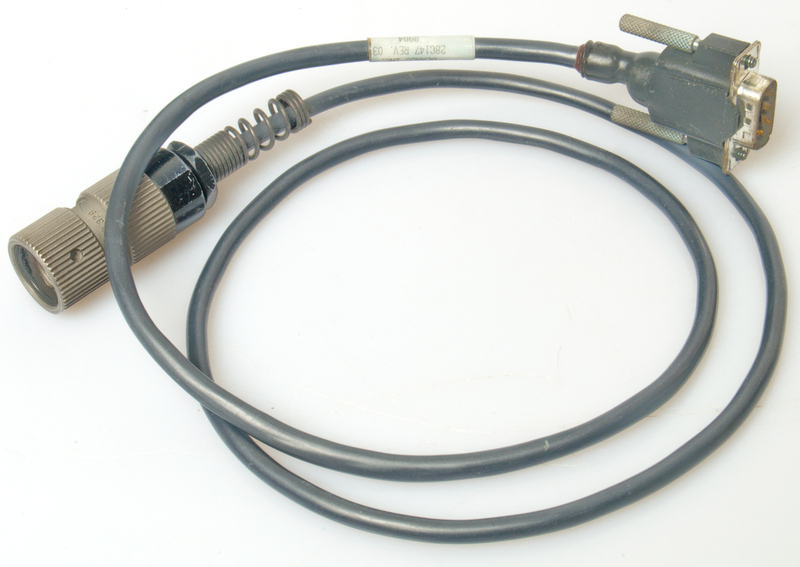 NSN 5810-01-066-7587 is an official fill cable. Some of the SINCGARS manuals refer to the W4 as an Audio/Data/Fill cable. 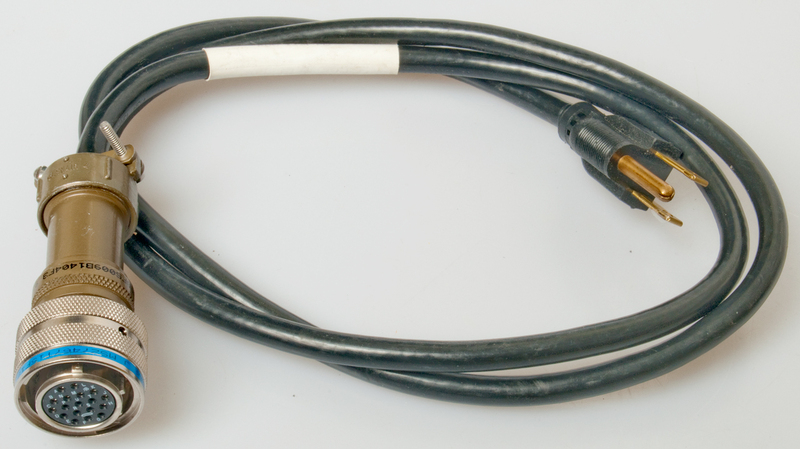 It's wired 1:1 on 6 contacts of the AUDIO connector. 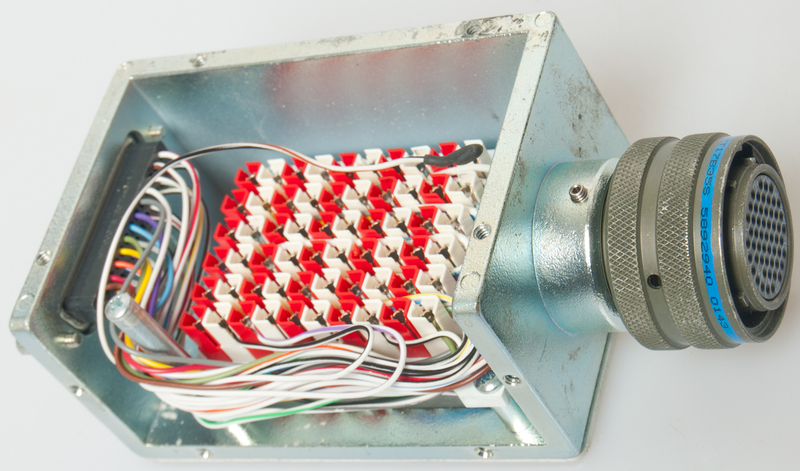 Taking a look at how this connector is used for: Audio, Fill, Data and Retransmission. 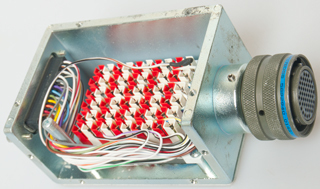 Used to check the cables and junction boxes in a VRC-12 series vehicle installation. Used to measure the Bit Error Rate of a channel where VINSON will be used. An idea would be to use a diode noise source and after amplification drive a PIC micro controller. The PIC would look at two successive data bits and if they were the same get two more. If the input was 10 a 1 bit would be shifted into a byte, if the input was 01 a 0 bit would be shifted into a byte. When the byte was full it would be stored and after say 8 or 16 bytes were stored they would be sent out an RS-232 data port. By using the noise diode and NOT using an algorithm the numbers would be nearly random. But using the simple algorithim described any bias is removed and the resulting data stream is truly random. A refinement would be to take the 8 or 16 bytes and pass them through something like the Tiny Encryption algorithm to really mix them up. But it's not clear that this really buys anything when compared to the simple way. hardware white noise generator -gain of 1000 x voltage following a noise source drives the digital input of a PIC microcontroller. An algorithm is how you get from plain test to the cipher text. They are catagorized by how secure they are with Type 1 being the best. A protocol has to do with the layers below the algorithm down to the physical layer. For example the KY-57 Voice Encryption unit is a Type 1 product that makes use of the SAVILLE algorithm (Wiki 128 bit key). It's a member of the VINSON family of products that can interoperate which includes the KY-57, KY-58, KY-68, KY-99a, KY-100, KYV-2, FASCINATOR and SINCGARS or other radios with imbedded VINSON capability. Type 2 cryptographic algorithms for use in communications systems endorsed by NSA. These include classified algorithms. d) Secure Hash Algorithm (SHA). Exportable Type 4 cryptographic algorithms Registered with NIST but not FIPS. This is the [an error occurred while processing this directive] time this page has been accessed since since 14 Dec 2002.